Finish a job from which a guildmate has not returned. After fencing 400 gold in stolen items, talk to S'Krivva. Travel to Skingrad to locate the missing thief Theranis and the book Lost Histories of Tamriel. Follow Theranis' trail in Skingrad to Castle Skingrad's dungeon. Free a familiar face and retrieve the book. After fencing items until you've received at least 400 gold from your illicit dealings, speak to S'Krivva in Bravil. She will tell you that another thief, Theranis, was sent to steal the book Lost Histories of Tamriel from a wizard in Castle Skingrad. You have to recover the book for the Gray Fox, with or without Theranis. Travel to Skingrad and talk to any of the beggars to discover that Theranis has been arrested after drunkenly bragging about stealing the book at a Skingrad tavern. You will have to get into Skingrad dungeon to talk to him. Upon traveling to Castle Skingrad and locating the dungeon it becomes obvious that talking to Theranis won't be a simple task. The door to the cells in the dungeon is locked and the guard posted outside cannot be bribed to gain access. Raising the guard's disposition to get him to accept the bribe will not work. However, raising his disposition may help you later in the quest. Talking to the guard will allow you to glean the information that Castle Skingrad's butler, Shum gro-Yarug, is looking to hire staff. Live on the Wages of a Slop-Drudge: This is the method suggested by the quest. After gaining the tip from the guard that the butler at Castle Skingrad is looking to hire staff, track him down and speak to him. The butler, Shum gro-Yarug, is normally located in the Skingrad County Main Hall, however asking around at the castle will reveal he has a daily schedule he sticks to - he travels to the West Weald Inn at 10am and then to the Colovian Traders at noon. Once you speak to him about gaining a job at the castle, he will tell you his need to hire a new 'slop drudge' to feed the prisoners. The pay is terrible, and he is genuinely surprised when you choose to accept the job. Shum will indicate that you can choose to feed the prisoners at any time of the day, and that the guard in the dungeon will open the main door for you. Return to the dungeon and speak to the guard, using the new dialogue option indicating you are the new slop drudge. The guard will grumble about having to open the door - wishing they would just give you a key - but will oblige, granting you access to the cells. Break into Jail: Sneak or use magic to break into the dungeon. You can also pickpocket the key from the dungeon guard (particularly easy if you follow the off-duty guard to his barracks and pickpocket him there). If you fail, however, this method can backfire, for example by causing a fight that injures your cell mate. Charm the Jail Guard: You can raise the disposition of the jail guard as high as possible, using some of the tips provided at the article on Disposition. Work quickly, as the door will eventually re-lock itself. Trojan Thief: Get arrested and choose the go to jail option. To intentionally get arrested, steal a cheap item from a guard. You should stow away your items in a safe place before attempting this method—just remember to keep a lockpick with you. Alternate Route: You can get into the jail cells using the secret back entrance. Enter the castle via the main hall. Pick the lock on the door to the dining hall area at the top of the main balcony in the alcove next to the long stairs that lead up to the Lord's Chambers. Go down into the basement through the pantry to the left (first door on the right). At the end of the Wine Cellar hallway, next to a small bedroom, activate the candle on the right to expose the secret tunnel to the prison. Once you've gained access to the prisoner's cells, it quickly becomes obvious that Theranis is nowhere to be seen. Only one prisoner is currently a guest of the dungeon, Larthjar the Laggard, a Nord hailing from Imperial City. Speak to Larthjar and you discover that a "Pale Lady" takes prisoners from their cells regularly, and when they've been taken for a third time they don't return. It seems Theranis has made his third journey with her days ago and she has now taken his Argonian cell-mate. Larthjar indicates that the Argonian put up a struggle and he was bleeding when he was taken. The trail of blood ends at the wall at the end of the passageway between the prisoner's cell. Looking around the wall you will notice that the sconce to the right of the wall marked as a "Strange Candle" can be activated - opening a secret passage. Following the trail of blood through a roughly hewn tunnel will lead you to another wall, this time with a lever on the left. Activating the lever opens the wall, leading back into the halls of Castle Skingrad. The trail of blood continues to the Skingrad wine cellar (the very one Shum gro-Yarug said he better not catch you in if you took the slop drudge job). The trail ends at a large wine cask - but logic dictates finding a switch to open yet another secret door. Looking around the other wine cask to the right where blood is also present will allow you to find another 'strange candle' switch - activate this to open the wine cask. Following another short hewn passageway will lead you to the hidden chamber with the Pale Lady holding audience in her feeding room. The Pale Lady will attack you on sight, so take her down quickly and watch out as you can contract porphyric hemophilia from her. This is one of the few cases where you are allowed to kill someone while on a Thieves Guild quest; you do not receive any blood price penalty for killing the Pale Lady. Once the Pale Lady is dead, you can survey the surroundings and will notice the body of Theranis on the floor and an Argonian in a cell. Looting Theranis' body will activate a quest message - but the book he had stolen is not on his corpse. Upon speaking to the Argonian prisoner you will discover it is your old acquaintance Amusei! He shares with you his current 'adventures' and indicates that Theranis told him where he hid his 'special treasure'. Amusei will agree to tell you where Theranis hid his treasure - which you assume to be the book - if you help him escape. Alternately, you could sneak behind the Pale Lady, pickpocket the key from her and free Amusei, assuming your sneak skill is high enough. You will want to have an invisibility on target or on touch spell in your inventory for the following to work. 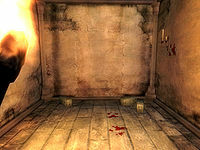 Use the spell on Amusei, then make yourself invisible and you can escape from the dungeon without bloodshed. If Amusei seems to get lost, don't worry. Just keep going to the objective marker and he'll reappear upon entering a new cell (when you see the loading screen). Open the portcullis on Amusei's cell using the key from the Pale Lady and he will start following you. You have to get out of Castle Skingrad without being detected (sneaking), so check the time of day before starting out - it is best to attempt to escape at around 2am, when all of the castle's inhabitants are asleep. Use the secret passage back to the wine cellar. Now you can go back the same way you came, sneaking past the dungeon guard, maybe also using chameleon (this is the easiest way as you have only one NPC to sneak past). If the guard catches you and your personality is 100 and the guard's disposition is already maxed, he will let you go with a warning. Exit to the courtyard. Or you use the longer way: turn right as you arrive the wine cellar and exit using the door to the Castle proper which leads to the Dining Hall area. There may be people in the Dining Hall when trying to escape with Amusei, although this can be avoided by waiting until nightfall. Sneak by—using Invisibility/Chameleon as required depending on your sneak ability—when they are sitting at the table with their backs to the door, or you will get a 500 gold bounty. If you don't commit any crimes (like killing guards), however, this bounty will be removed when you get to the safe point outside the castle and have met with Amusei (if he was not with you at the time). Proceed through the dining area to the door on the right. This hall leads to another door leading back to the courtyard area. If Amusei tends to run around to another door after you've gone through a locked door en route, try reverse pickpocketing the Skingrad Castle Key onto him. While you will then have to pick door locks, at least he will follow you rather than running a different route in front of a guard. Leave the castle grounds via the main gate and cross the bridge leading back to the path to Skingrad. The guard that is normally present at the archway to the bridge should be absent. Make sure you follow the actual path down the hillside towards town - don't shortcut down the hillside to the left as the quest flag may not update. If you have decent armor and endurance, you can use another, fairly easy route. Simply run past everyone, and when the guards try to stop you use the resist arrest option. The guards will attack you, but not Amusei. Do not attack the guards or kill them, as that will put an even larger bounty on your head. Keep running until you get to the courtyard, then tell Amusei to "wait here." Yield to the guards, and either pay the fine or go to jail. If you go to jail it is not advised to break out, because then you just have another bounty on your head. When you leave jail or finish paying the fine, Amusei will either be with you, or will be where you left him. Talk to him and tell him to follow you, then leave the castle. Once you have received a quest update message indicating you and Amusei have successfully escaped, talk to Amusei and he will tell you that the 'treasure' is located "under the bush near the well, behind Nerastarel's house". He will also admit he was going to retrieve it himself, but he owes you for bailing him out. It seems he is going to try his hand again at entering the Thieves Guild. Locate Nerastarel's house in Skingrad, it is directly across from Hammer and Tongs. Retrieve the book from behind the bush at the rear of the house, near the well as per Amusei's instructions. If you are having trouble defeating the Pale Lady without contracting porphyric hemophilia and are decently fast, you can provoke her from a distance and then run back to the castle courtyard. Once you are outside, daylight and the castle guards will do most of your work for you. Most residents of Skingrad castle are included in the list of NPCs whose death will incur a Blood Price during this quest. This is an issue for Mercator Hosidus in particular, who dies during the Mages Guild quest Ulterior Motives. If you have 100% Chameleon or an invisibility potion there is no need to worry about people spotting Amusei. People will yell that prisoners are escaping but they will make no attempts to stop you. If you lock Amusei in the secret passage (close it before he comes out) after you rescue him, you can escape without him. Then just wait an hour by where you two were supposed to meet up and he magically escapes without giving you the bounty of 500. It is highly inadvisable to undertake this quest while any other quest involving Count Hassildor is active, since he may track you down to advance the other quest while you are trespassing. The book does not exist until Amusei tells you where to look for it. An easier alternative to escape without much work is make sure you have enough gold to pay for the bounty and then choose the " Pay gold" option when the guard catches you. When you end up outside the castle Amusei will still be there with you. You may have to reenter and re-exit the castle for the quest to move on. This is the only quest wherein Nerastarel's house is mentioned. Shum gro-Yarug may be the most likely candidate for "sudden NPC death", because he tends to fall from the bridge. You can use the console commands: prid 0002C466, resurrect 1, enable to fix this. Sometimes when leading Amusei out of the prison, he will disappear. The game will still think he is following you however: you will still get fined 500 gold if a guard catches you and you will still get the journal update from reaching the point outside Skingrad. He will be nowhere to be found. If you sleep in one of the prison beds, Amusei will reappear. Or, if you are arrested (if you got caught), after you pay the fine, Amusei will be right there, ready to tell you where to find the book. If the guards attack you while breaking into the dungeon, and you free Larthjar the Laggard, he will help you fight the guards. If the guards defeat him, rather than dying, he may freeze in midair. ? As you are sneaking out of the ale barrel secret door, Janus Hassildor may walk up to you. If you are in sneak mode and in the shadow, he will not see you will activate you repeatedly and not leave. If you begin to move he will attack you and you will receive a bounty. ? 8 A beggar reminded me that S'krivva can be found at the Lonely Suitors Lodge and at the Arena. I'll need to speak with her to see if there are any special Thievs [sic] Guild assignments available. 10 S'krivva of the Thieves Guild has asked me to find out what happened to the thief named Theranis. He was sent to steal a book entitled Lost Histories of Tamriel from the wizard in Castle Skingrad. My job is to recover the book. S'krivva doesn't care if Theranis delivers it to her or I do. I'm getting 400 gold coins either way. 15 I discovered that Theranis was arrested. It seems he was found in a tavern, drunk and bragging about stealing something from Castle Skingrad. The Captain of the Skingrad Guard overheard him and arrested him. I'm going to have to break into the dungeon if I want to speak to Theranis. 20 I tried to bribe my way into the jail to see Theranis, but the jailor is too honest. Either that or he is terrified of Count Hassildor. It's too bad I can't get a job in the castle. What does a guy have to do in this town to see the inside of the jail? Get arrested? 25 It seems that the butler, Shum gro-Yarug, is hiring up at Castle Skingrad. Penetrating the castle would be much easier if I had that job. 30 I got myself hired as a servant in Castle Skingrad. I only have access to the Great Keep, but that should help. Shum gro-Yarug says that the jailors will open the prison door for me. Now I just have to find Theranis. 40 The only prisoner in Castle Skingrad's jail is Larthjar. He told me that the Pale Lady, whoever she is, took Theranis days ago. I don't like the sound of that. There was an Argonian prisoner in the same cell as Theranis. Apparently he was also taken by the Pale Lady just a couple of hours ago. The Argonian put up quite a struggle and was bleeding. It's the only clue I've got right now. I'd better follow it. 45 Theranis is dead. I found his body in the secret chamber with Amusei and the Pale Lady. 50 The Argonian in the cell with Theranis turned out to be Amusei! Before he died, Theranis told Amusei where he hid a special treasure, which I assume is the book. If I can get him out of here, Amusei will tell me where the book is hidden. Of course being seen helping a known prisoner to escape is a crime. I'll have to avoid the guards in the castle. 51 Amusei and I escaped from Castle Skingrad. Let's see if he will keep his word and tell me about the book. 52 Amusei was grateful for being saved from the Pale Lady and told me where to find the book. It is under a bush, behind Nerastarel's house, near a well. 60 I have the Lost Histories of Tamriel. Now all I have to do is return it to S'krivva in Bravil. 70 Finishes quest S'krivva has rewarded me for recovering Lost Histories of Tamriel. 60 I have killed someone while trying to the Lost Histories of Tamriel. I've been warned that I'll have to pay a blood price if I want to stay in the Thieves Guild. I can pay S'krivva. 61 S'krivva has kicked me out of the Thieves Guild for killing someone while recovering Ahdarji's ring. The only way I can get back into the guild is to pay a blood price of 1000 gold coins for each person I killed. I can pay S'krivva. 65 Finishes quest When I paid the blood price, S'krivva restored my standing with the Thieves Guild. It is possible to use the console to advance through the quest by entering setstage TG06Atonement stage, where stage is the number of the stage you wish to complete. It is not possible to un-complete (i.e. go back) quest stages. See SetStage for more information. Esta página foi modificada pela última vez à(s) 21h31min de 31 de dezembro de 2015.